“Seek first the Kingdom of God….” Jesus was a man who practiced what he preached. He lived, ate, breathed the kingdom. He advanced it through his ministry and he opened the doors to it through his death on the cross on our behalf. In other words Jesus was all about the Kingdom of God. Christopher Morgan and Robert Peterson. The Kingdom of God, Crossway, 2013. The “Kingdom of God” has been the central focus of theology for many protestants over the last several decades and for good reason. Jesus emphasizes the Kingdom throughout the Gospels, theologians have widely speculated about the nature of the kingdom, and have given even wider speculations about how the kingdom relates to eschatology. (I’m looking at you my dispensationalist friends). 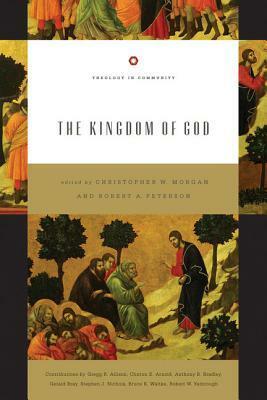 Along comes this book by Morgan and Peterson, they seek to give some clarity about the Kingdom of God. To do so they have collected essays by some well noted scholar to treat five different areas: 1) Historical, 2) Biblical, 3) Theological, and 4) Ethical. By adopting these perspectives they attempt to “move closer to a comprehensive exposition of the kingdom (Loc 217). This book has 9 Chapters: One on history, two on the Old Testament, three on the New Testament, 2 on systematic theology, and one on Ethics. Chapter 1 – Stephen Nichols writes a chapter on historical perspectives on the Kingdom of God. Chapters 2-3 – Bruce Waltke takes on the task of articulating an OT theology of the Kingdom. True to his reformed theology he pays special attention to the role of covenants in the Kingdom. Chapters 4-5 – Robert Yarbrough takes us through Matthew and Mark as a way to lay out the basic themes of the Kingdom in the NT. Then he gives us a brief overview of the Kingdom by reading Mark-The Epistles. Think of this as a survey of the NT. Chapter 6 – Still focused on biblical theology, Clinton Arnold tackles The Kingdom and Satan. He presents an excellent overview of what role miracles play in the kingdom, and what place satan and his demons have in it as well. Chapter 7– Ecclesiology meets Kingdom theology in this essay by Greg Allison. People often conflate the Kingdom with the Church. Allison gives us good reasons why that is a terrible mistake to make. Chapter 8 – Gerald Bray takes on Eschatology and the Kingdom. This isn’t your typical “speculate about world events” kind of eschatology. This is Systematic eschatology, focused on the nature of time, eternity, and the ascension. Chapter 9 – Anthony Bradley shows us what justice has to do with the Kingdom. Clinton Arnold’s Essay – This was my highlight in reading this book. Unlike some people who see Jesus’s miracles as merely authenticating his divinity (as though nobody else ever performed a miracle…) he shows that miracles are a foretaste of the kingdom. He also give a thorough evangelical treatment of demonology. The NT Survey Chapters – If I ever make my way out of teaching Pauline studies and teach the Gospels or an NT Survey I could see myself making use of this book. I would certainly make use of Yarbrough’s chapter on the Kingdom in Mark through the Epistles. The Book’s Price/Value – If you get the paperback it will set you back about $14. That isn’t too bad, but if you get it on the kindle (which I did) its only $0.99! For $0.99 a collection of essays by first rate evangelical scholars is a hard deal to pass up. With this book you get a lot of bang for your buck. Anthony Bradley’s Essay – I don’t know how else to say this, but this essay just doesn’t fit this volume. I know its about “Kingdom Ethics” but He never really makes the connection between why his ethical injunctions are the necessary overflow of Kingdom theology. An Undefined Audience – I am not exactly sure whom this book is for. Its fairly academic (if that means dry and full of footnotes) so I assume its for academia. However its so basic that it doesn’t add anything to the pool of scholarly resources. It also seems too basic for even seminary students. Is the target audience college undergraduates? I’m not sure. This book would certainly work as a textbook for a college bible class. But that isn’t the way this book was promoted. At $0.99 I don’t regret buying this book. I didn’t really learn much though (except for Clinton Arnold’s essay). So personally I wouldn’t shell out the $14 for the paperback. However I would make this book required reading in a biblical theology class for undergraduates. Previous Previous post: Give them the Tools they Need!